So this is a cookie that I acutally baked several weeks ago, but I never got around to posting the entry for it because it was the same week that I baked the Kitchen Sink Cookies.? Anyway, I made a few edits to the recipt below which I have not put in because I did not feel like complicating it.? In my version, I used Droste pastilles (milk chocolate and dark chocolate).? The cookies with the milk chocolate pastilles inside were glazed with white chocolate, and the ones with the dark chocolate were glazed with milk chocolate.? In the glaze recipe, you can just substitute white chocolate for the semisweet chocolate chips in the same amount – it will still work fine. 1. Preheat oven to 350o F. In a medium bowl, sift flour. 2. In medium saucepan, combine chocolate chips and butter stirring over very low heat until chips are melted and smooth. Add sweetened condensed milk and vanilla to chocolate mixture and mix well. Transfer to a large bowl and add flour mixture. 3. Shape 1 tablespoon of dough around each candy kiss, covering it completely. Shape into a ball and place 1 inch apart on un-greased cookie sheet. 4. Bake at 350o for 6 to 8 minutes. Cookies will be soft but will firm up as they cool. Remove from cookie sheets and transfer to wire racks to cool completely. Melt chocolate chips in a small saucepan with vegetable oil and stir until smooth. 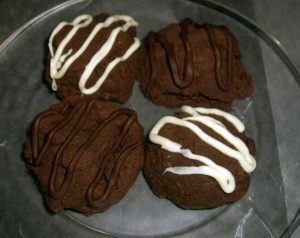 Drizzle over the top of the cookie and set on rack to cool and firm chocolate.